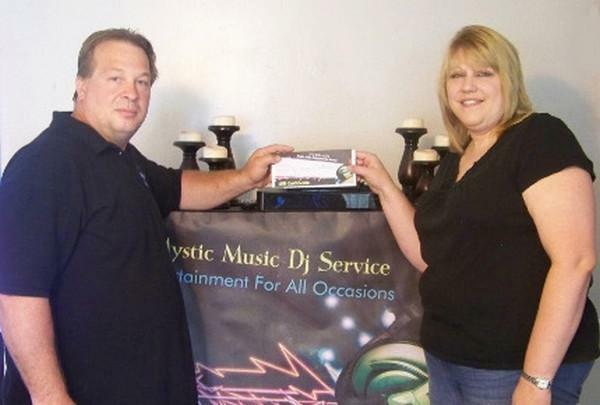 Ken McCann of Mystic Music DJ Service, presents Karen Perwitz, member of the Child Advocacy Center of Oswego County board of directors, with a gift certificate for a four-hour Mystic Music DJ Show. Mystic Music provides musical entertainment for weddings, birthdays, and parties of all kinds. A gift certificate for a four-hour Mystic Music DJ Show will be available as part of the drawings during the post Blue Ribbon Ride celebration at Lighthouse Lanes on Shampine Drive, in Oswego. The celebration, in honor of the Child Advocacy Center (CAC) of Oswego County's 10th Annual Blue Ribbon Ride Against Child Abuse, also includes a family-bowling event from 2:30-4:30 p.m., with a chicken BBQ, drawings for themed gift baskets, an official hockey stick signed by members of the Calder Cup Finalist, Syracuse Crunch Hockey Team among other items, and live music with F5, beginning at 5 p.m. The after-ride celebration is open to the public. Proceeds from the event support the Child Advocacy Center's Blue Ribbon Campaign that focuses on child abuse awareness and prevention. The ride will take place Saturday, Sept. 7, beginning at 3 p.m. at Wheel-A-Way Motorsports, 947 S. First St. (Route 57) in Fulton and ending at Lighthouse Lanes in Oswego. Registration begins at 2 p.m.
For more information, contact the CAC at 315-592-4453 or visit www.oswegocac.org.